I know this picture is blurry (I think the lens on my cell phone camera is dirty) but I wanted to mention how much I love St. Michael's Winery Gollywobbler Red. The Gollywobbler White is pretty good too, but my favorite is the red. This stuff tastes like concord grape jelly with a kick. It is available at only a few liquor stores in Howard County. St. Michael's also makes a Chocolate Zinfandel that I have tried, but costs twice as much for a bottle half the size, and I don't think that it tastes good. If you want to recommend any other wines (Maryland or not), give a shout in the comment section. 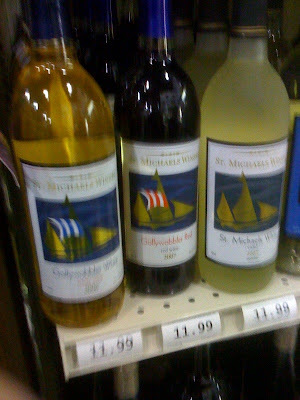 Update: It appears that not all the liquor stores that sell St. Michael's wine sell Gollywobbler Red, specifically. I know that you can get it at the liquor store in the King's Contrivance Village Center, Pine Orchard, and Woodbine Wine and Spirits. Explains your goofy blog - you need to drink less and worry about what the Dems in power are doing to you and your wallet! If you think that it's only the Dems that are looting us blind, think again. Republicans are no better. I tried beening a Republican for most of my life, now I trying to be a Democrat. My favorite drink is Coke. I am trying to find it with cane sugar, but as I have found with politics, sometimes you drink the sweet, sometimes the bitter.